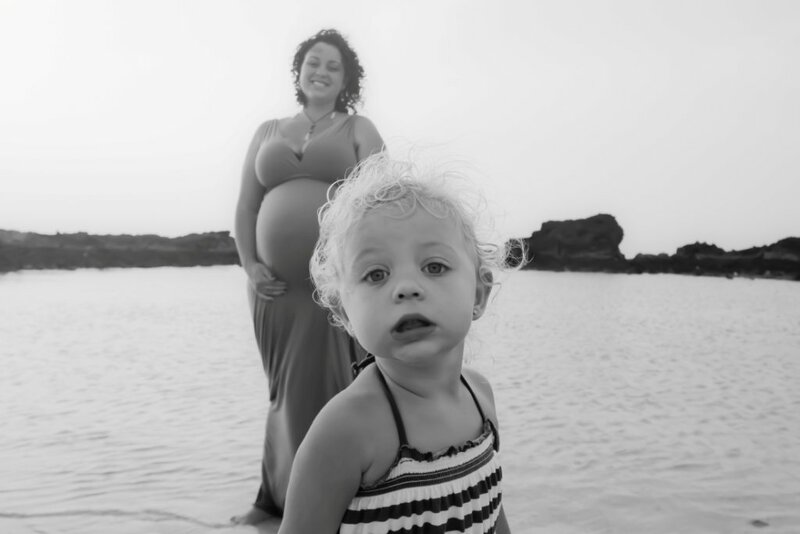 Ever since Demi Moore’s bold pregnancy photo graced the cover of Vanity Fair, women have been inspired to professionally document their pregnancies with maternity portraits. And no wonder, pregnancy is a fascinating time, bringing remarkable changes to women’s bodies. A pregnancy portrait is not just a great souvenir, or the first photograph in your child’s baby album, but also a beautiful way to get used to and appreciate your new body image. Many women are not sure what to expect during a maternity photo shoot, but most leave feeling like they have spent a few fun hours being pampered and feeling beautiful. In my home studio, I use candles and music to help create a relaxing atmosphere. With all the body changes during pregnancy, some women are not sure what to wear to a maternity photo session. My advice is to keep it simple and subtle, your husband’s dress shirt, a black or white lingerie robe, or a sarong and bikini at the beach. Simple thin clothing works well to show off the pregnancy and your belly, which is what we want. 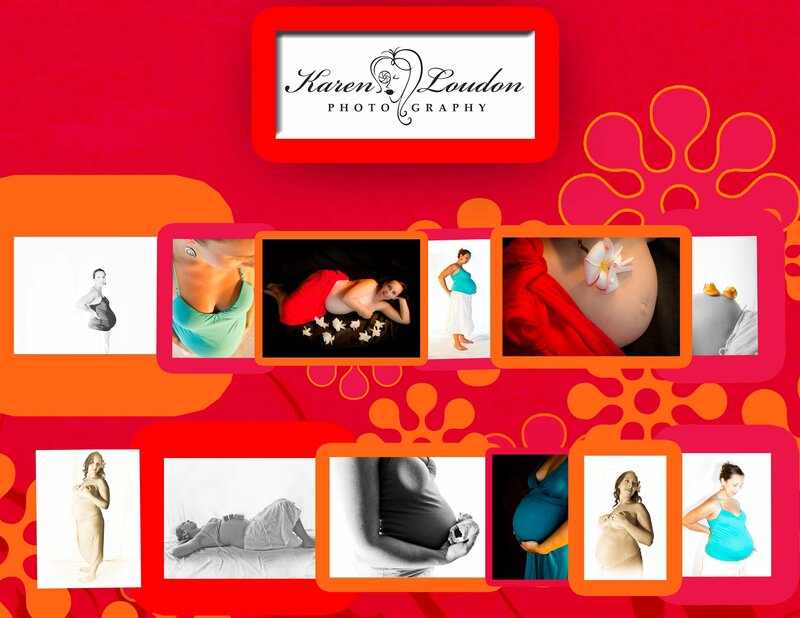 You should wait until the third trimester before planning maternity portraits. That way I can capture the fullness of your belly. It is best to be close to the end of your pregnancy. Yes, you will be bigger and will have gained some weight, but this is part of the beauty of pregnancy. 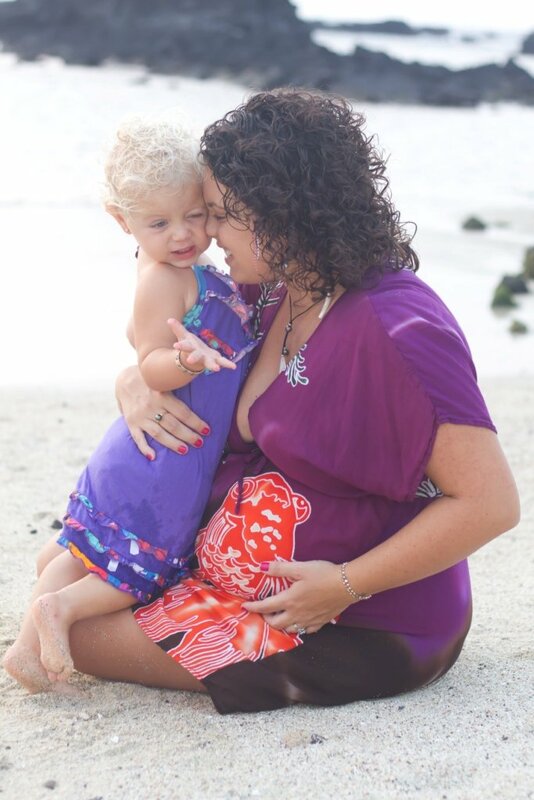 Capture the beauty of your big belly and be proud! 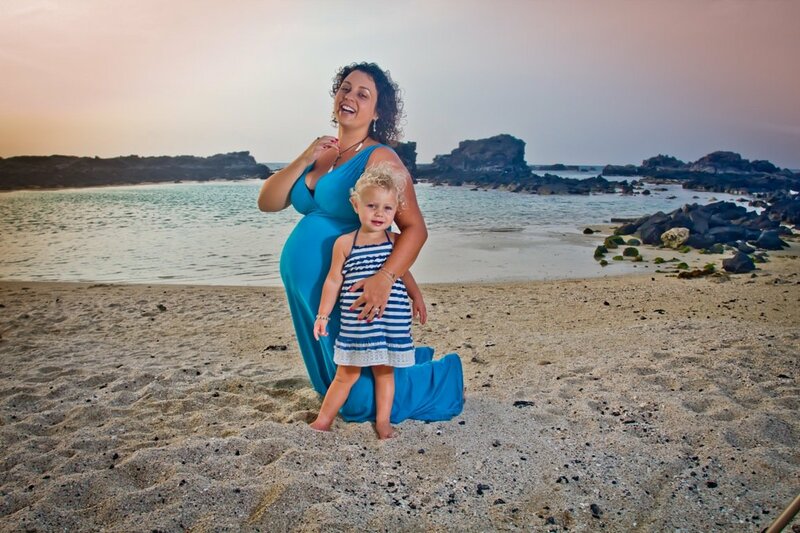 I have been coming to Kukio (Kikaua Point Beach Park) with my daughter since she was 5 weeks old so I was thrilled when Vanessa chose this location for her maternity photography session. Vanessa wanted to include her active toddler daughter in the photographs which was quite a challenge, but well worth all the running around. I think we got some really fun photos in the end! Kukio is one of my favorite beach locations. The shallow water in the morning lends itself to bright turquoise, and the sunsets are spectacular. We call Kukio the baby beach because it is basically a walled in wading pool with clear blue waters, ideal for young children. The wall forms a natural protective barrier from the surf and currents and many families come here to relax and enjoy the calm waters. The sand space is large, clear, white and inviting. The landscaping provides ample trees and plenty of shade. Kukio beach is located at the end of the grounds of the Kukio oceanfront residential community. As with many resorts along the west Hawaii coast, there is a gated entrance. Let the staff member know that you are going to the Public Beach access and he will give you a pass to place on your windshield. There is limited parking spaces at the beach so be advised. Once you go through the gate, follow the Public Beach Access signs through the resort to the parking lot adjacent to the water. The beach access is nicely designed with a paved walking path through the lava rock to the shore. Directions: Take Queen Kaahumanu Highway ( #19) north of Kailua-Kona. At mile marker 87 take a left onto Kukio Nui Drive. Follow Public Beach Access signs.